Before exporting a volume to SEG-Y, Insight allows you to edit all three SEG-Y text headers to match to your standard format: EBCDIC (text) Header; the per file Binary Header; and the per-Trace Header. If you already have a template, you can also load it to use. In the SEG-Y Header Editor, click Trace Tab. Here you can modify (almost) all trace headers, or create new ones never found in nature. Options for source are: Empty, a customised formula or Header. Custom headers can be added in the custom headers section. The value column is edited dependent on the source selected. Automatic - TRACL and TRACR are automatically set per the SEG-Y standard. TRACL is a trace counter for the entire 2D line (or 3D volume); and TRACR is a trace counter that resets to 1 at the start of each SEG-Y file (if you've checked the "Split file if too large" box in the Export Volume dialog). Empty - Set this header to 0. There is unfortunately no unambiguous empty value in SEG-Y, but 0 is typical. Header - Copy the value from another header into this one. Custom Headers: Here you can create additional headers of (almost) any size and location. You should avoid custom headers whenever possible, because they do not conform to the SEG-Y specification. In addition to the usual parameters, you must provide a byte location and length (2 or 4 bytes) for the custom header. It shows which standard headers you're overriding by highlighting them in red. It will not permit you to override a mandatory automatic header. 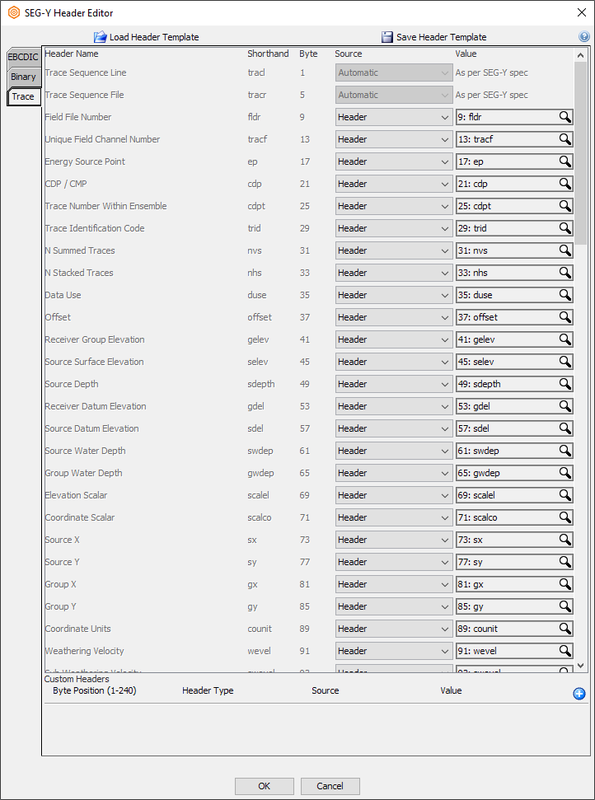 Note that the headers selected in the "Header" and "Formula" modes refer to the value of the header in the input volume, not the value after being modified according to this table. Otherwise, it would not be possible to swap the position of two headers. Headers affected by scalars (X/Ys, SDEPTH, etc.) are manipulated in their scaled form, not as raw headers. In other words, if you use the value of (for example) SDEPTH in a formula, it will be the real human value after the SCALEL is applied. Likewise, if you want to assign a value to e.g. SDEPTH, it should be the normal value without considering the value of SCALEL. There is almost never a good reason to adjust SCALEL (byte 69) or SCALCO (byte 71) here. Instead, use the "Reassign SCALCO/SCALEL Headers" process to fix the volume prior to export. Insight doesn't allow floating point headers as this effects the accuracy of the data. A 4-byte floating-point value is large enough for 6 - 7 decimal digits of precision -- which will induce 1 - 10m of error for a typical coordinate. It's far better to store the value(s) in SX/SY/GX/GY/CDPX/CDPY and use SCALCO = -100, with which you'll introduce less than 0.01m of error.